No automotive segment is as competitive as the mid-size SUV segment. With nearly two dozen competitors in the segment, they are a common sight across the roads of Hamburg and the parking lots of Reading and Allentown. Making one that stands out from the crowd might seem to be a difficult task. With so many competitors, it’s pretty much impossible to be number one in every area of measurement – so it comes down to the individual carmaker to develop what they think is a winning package. Ford has been a longtime leader in the category, with the early Explorers and the current 2019 Ford Edge being well-known names. Ford has rested on their laurels a bit, and they’re no longer at the top of their game. That’s where vehicles like the 2019 Hyundai Santa Fe comes in. While the Santa Fe has been around in one guise or another for nearly two decades, the current two-row mid-size SUV format is a new one for the name. But while the format may be new, this year’s Santa Fe retains the value and reliability that Hyundai has become known for. Is the 2019 Hyundai Santa Fe or the 2019 Ford Edge a Safer SUV? We want the streets of Hazleton and Bethlehem to stay safe, for our families, our friends, and our neighbors. That’s one of the best things about the 2019 Hyundai Santa Fe – it prioritizes safety. While these systems are fairly standard for today’s technology, the Santa Fe takes another step. Safe Exit Assist, standard on all Santa Fe models, detects upcoming traffic and prevents the rear doors from being opened into busy streets, keeping your backseat passengers safe when exiting the vehicle. On all trims above the SEL level, Rear Occupant Alert is standard. Infants, young children, and pets are put at risk every year when accidentally left in the rear seat of vehicles. A sensor triggers an alert when the vehicle is turned off, reminding the driver to check the rear seat – keeping your family as safe as possible. With the 2019 Ford Edge, some of these features are standard from the start, but Smart Cruise Control isn’t offered on the base trim level, and no Surround-View option is offered. More importantly, Ford has not taken the step towards advancing safety features like Hyundai has, and they don’t offer equivalents to the Safe Exit Assist or the Rear Occupant Alert. Does the 2019 Hyundai Santa Fe or the 2019 Ford Edge Have a More Versatile Design? Part of making your mark in such a crowded class is sticking out in the daily parade of commuters from Hamburg to Reading. Exterior design hasn’t exactly been a hallmark of the midsize class over the years, but the 2019 Hyundai Santa Fe is making an effort to change that. A cabin that sits a bit more upright, an aggressive stance, and curvy sheet metal helps the Santa Fe to differentiate itself in the parking lots of Bethlehem. It all starts with the redesigned front grille that helps the Hyundai logo to pop, narrow and angled upper headlights that give it a predatory appearance, and the sharp slash of chrome across the front end. Available premium stain or dark chrome door handles add a touch of luxury. Sticking to more traditional design, the 2019 Ford Edge is pleasant, but it certainly won’t differentiate itself from the rest of the people-carrying crowd in the parking garages of Reading. The three-bar grille is aging, and the sheet metal is uninspired. It’s clear that, while the Santa Fe is a fresh new look ready to move into the future, the Ford is still trudging along with an outdated design. Is the 2019 Hyundai Santa Fe or the 2019 Ford Edge a More Reliable Vehicle? Hyundai continues to offer epic vehicle warranties that ensure that your Hyundai vehicle is covered for service at Freedom Hyundai well into your ownership. 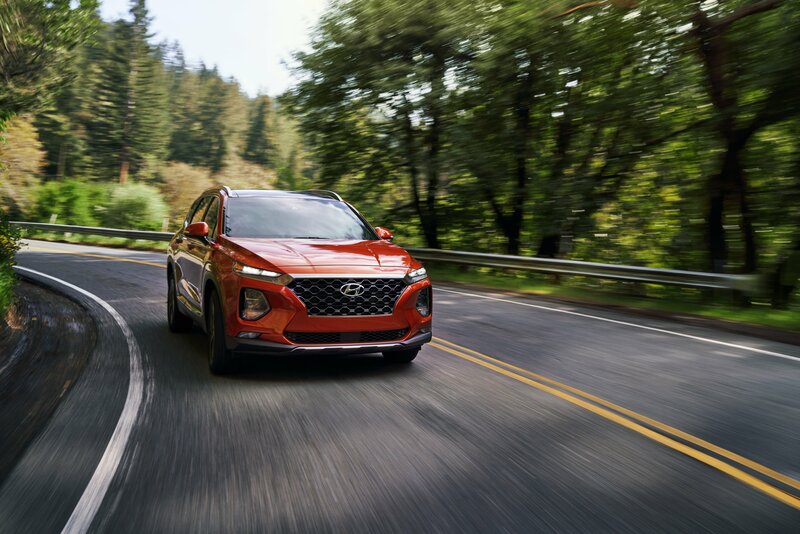 Just like every new Hyundai, the 2019 Hyundai Santa Fe features 5 years and unlimited miles of 24-hour roadside assistance. Should something go wrong, the new vehicle limited warranty extends for 5 years and 60,000 miles, while the powertrain limited warranty goes for 10 years and 100,000 miles. Hyundai must have the salted winter roads of Reading, Hamburg, and Hazleton in mind with the 7-year anti-perforation warranty with unlimited mileage. Ford doesn’t seem to want to stand behind the 2019 Ford Edge quite as much. While they match Hyundai for roadside assistance, they only provide a 3-year, 36,000-mile new vehicle warranty, and the 5-year, 60-000-mile powertrain limited warranty is barely half of what Hyundai offers. They also must be expecting less ice and snow, as they only provide 5 years of corrosion coverage. Do you trust the carmaker that merely says it is reliable, or the one that is willing to put its money where its mouth is? Which SUV has Better Value? The 2019 Hyundai Santa Fe or the 2019 Ford Edge? We haven’t talked about passenger space, cargo space, power, fuel economy, or features much – and for good reason. Both the 2019 Ford Edge and the 2019 Hyundai Santa Fe are extremely similar on these fronts. Both have nearly identical interior space, and many of the same features available including Apple CarPlay and Android Auto compatibility. Both offer similar fit and finish throughout the interior. What matters is what it’s going to cost you. We like a bargain – just like our friends in Hazleton, Allentown, Bethlehem, and across the Lehigh Valley. And that’s exactly what the 2019 Hyundai Santa Fe is. While it has the same capabilities, the added safety and excellent warranties come at a much more budget-friendly price. For instance, the base Edge SE with All-Wheel Drive is priced on par with the Santa FE SEL Plus. That means heated front seats, Rear Occupant Alert, 8-way power-adjustable driver seat, a 12-speaker Infinity Premium Audio system, dual-zone front automatic temperature control, and a leather-wrapped steering wheel. It even comes with the hands-free smart liftgate with auto open. In the Edge? No heated seats, a six-way manually adjustable driver seat, the standard six-speaker stereo system, basic climate control, and the standard plastic and rubber steering wheel. And you’re stuck with a manual-opening liftgate. It’s clear the Hyundai is the better bang for the buck. The 2019 Hyundai Santa Fe provides a smarter package, with your wallet and safety in mind – all without diminishing capacities or capabilities. It’s clear that Ford needs to go back to the drawing board with the Edge, as it can’t keep up. Here at Freedom Hyundai of Hamburg, you can check out all the versions of the Santa Fe - we’re the leading Hyundai dealer in the Reading, Hazleton, Allentown and Bethlehem areas. Come visit us today and get behind the wheel and see which Santa Fe is the right fit for you!